I have been told that I have been blessed with a friendly personality. Before I embarked on this beautiful journey I was able to take advantage of the wonder that is the internet to start building friendships with the other students in the REU program. One of the students had created a Facebook page in order to keep everyone connected during the summer. Wasting no time, I posted a simple greeting expressing my excitement. Sixty comments later I had a group of people who I couldn’t wait to meet. This interaction allowed the other students and me to enter this program with common ground. We were able to learn about each other’s interests and hobbies without even leaving our homes. This eased my mind some when the day came for me to leave Tucson. Is that 64 comments I see?! The program director, Connie, asked one of the REU students who normally goes to U of R to pick me up from the airport. She, Chelsea, was very nice in both Facebook conversation and texting. Needless to say, I was grateful at her generosity. My excitement built as my plane swooped onto the runway. 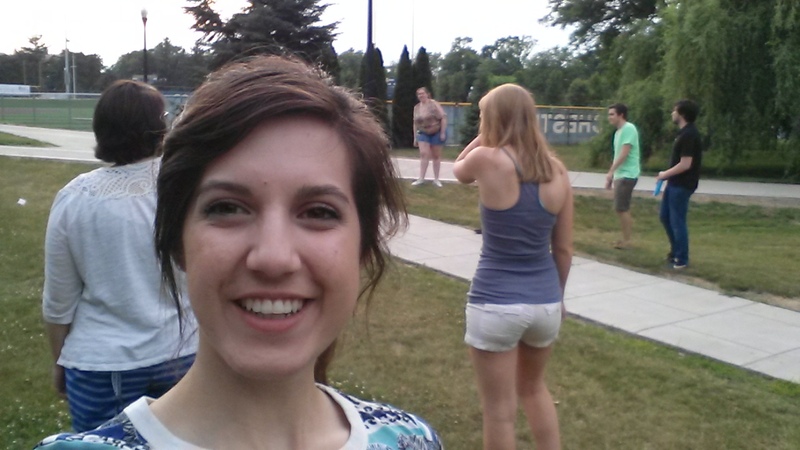 I felt my smile widen upon seeing the trees and greenery of Rochester. Chelsea, and another REU student named Tanveer, were waiting for me outside the terminal. Chelsea shifted the contents of her car, one item being an ice scraper (such a foreign object to me) to make room for my luggage. It was colder than I expected, but the others seemed content in their shorts. Chelsea drove us to the University where I met Connie and dropped off my suitcases. More importantly, we picked up several more passengers and headed out for my first dinner in New York! That macaroni and cheese bacon hamburger (I was feeling adventurous) marked the beginning of many fun times to come. These were my new friends (well, some of them). The next night they had a game night planned. There is a Physics Optics and Astronomy Library on campus that REU students are allowed to use 24/7. Naturally, this was the perfect setting for a big hangout. We played a game called Mafia for hours, and we laughed the night away. This was a regular occurrence in the first couple weeks here. Beyond playing games inside we have also found fun things to do around Rochester. The other weekend, for instance, I went with some friends (Rachel, Steve, and Amber) to the East End festival. 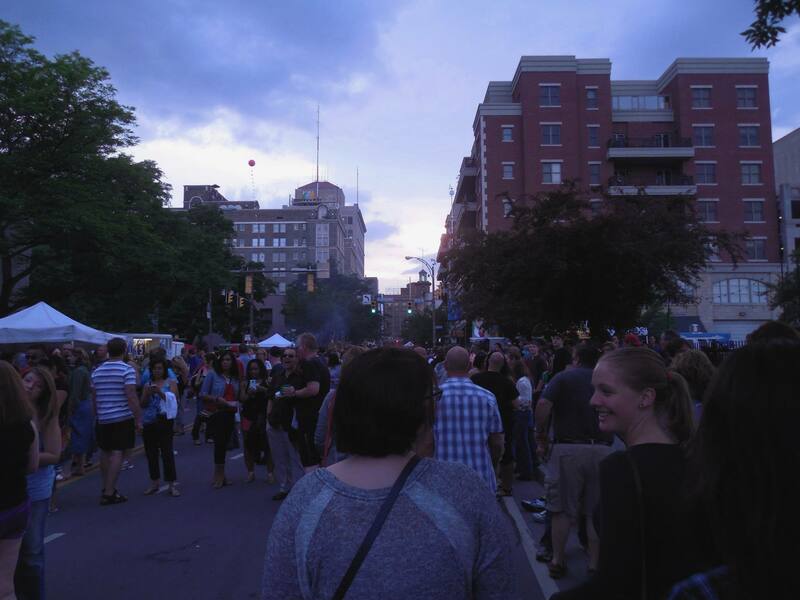 Rochester is known for is festivals over the summer. The East End festival involves several live shows from many different local bands. We heard styles such as hard rock, funk, and “electrofunkstep.” Huge crowds showed up to enjoy the music and food trucks that lined the sidewalks. I tried an arepa and a deep-fried Snickers bar for the first time ever. Let’s just say they were incredible. During the concerts I really wanted to crowd surf, but I chickened out. Next time I have a good opportunity, though, I am taking it! 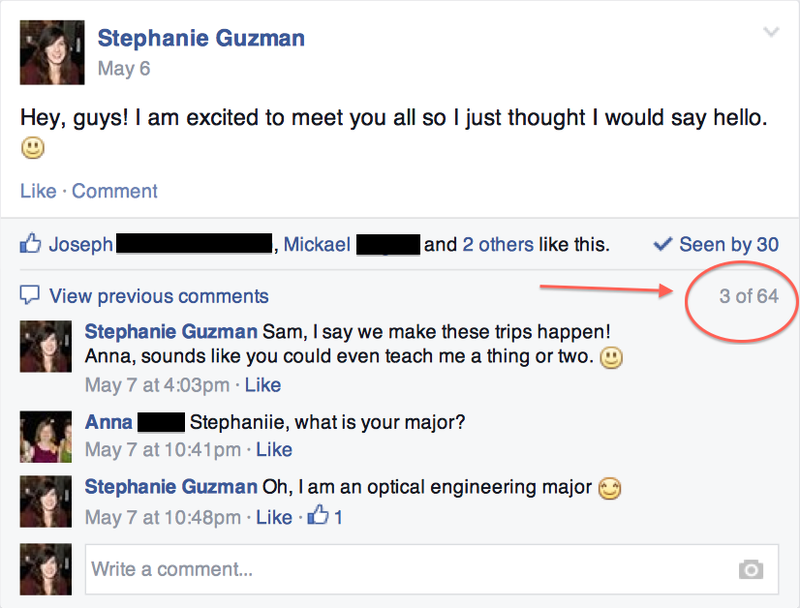 Stephanie is currently an undergraduate at the University of Arizona. She is studying optical science and engineering. For the summer of 2014 she is participating in a Research Experience for Undergraduates program at the University of Rochester. Her favorite hobbies are singing and creating YouTube videos. This entry was posted in College Life, Research and tagged REU, Rochester, UofR. Bookmark the permalink.